The Kea (Nestor notabilis) is a true alpine parrot, endemic to the Southern Alps of New Zealand. This is the inspiration for Aoraki Adventures' branding. These amazing and intelligent birds are sadly an endangered species. 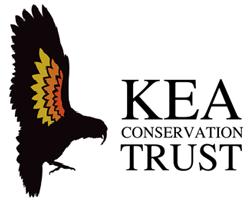 Alpine Guides is proud to sponsor the Kea Conservation Trust. Please visit the Kea Conservation Trust's website to learn about current research projects and how you too can support them. Kea, Nestor notabilis, with their distinctive jade and orange plumage.